Last year this time I was in hospital, recovering after the birth of our daughter. Time really flies! Our daughter turned 1 this week. Till now I’ve never made a pink cake but this time I fell for clichéd & wanted to celebrate her birthday with a pink cake. 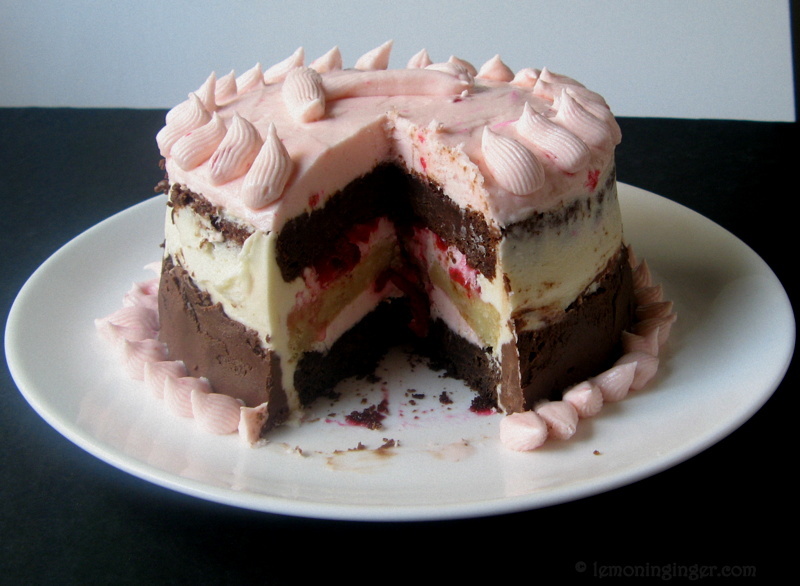 I’ve come across several Neapolitan Cake/ bars/ ice-cream etc on various blogs. 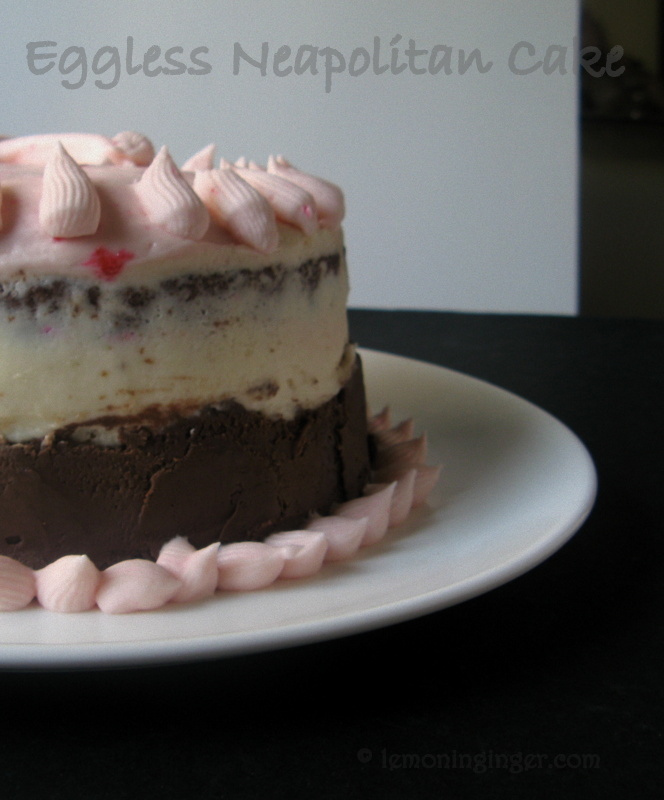 So even I gave in to the rage & decided to do a Neapolitan Cake for her. I customized the cake – used regular milk for cake & felt that the batter was too thick so added another 1/4 cup milk. I baked the cake in 6″ pan. I made chocolate cake twice to get 2 layers. I increased the baking time accordingly. The cake was very soft & fragile & I strongly recommend using a baking paper on top to un-mold. I also added lemon peel & cinnamon stick to compote. 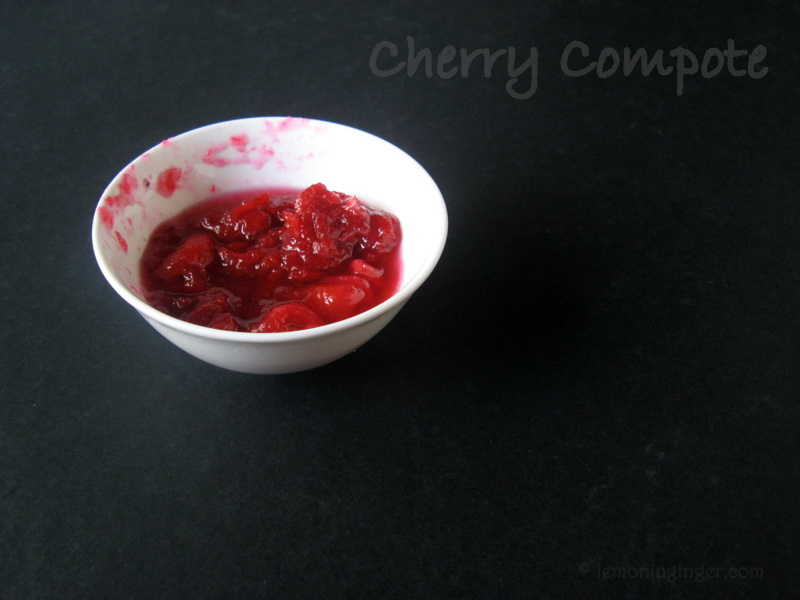 The cherry compote was the highlight of the recipe. It is really worth licking off the spoon! The cake was really nice, despite the sad decorating skills the cake looked pretty tempting. Taste was gorgeous despite the buttercream. I recommend this cake without buttercream frosting, with just compote as filling & topping. Or using whipped cream in place of buttercream. Recipe Source – loosely adapted from Is that really Vegan?? Pre-heat the oven at 180 C. Line & grease an 6″ round pan. In a bowl, cream the butter using a hand mixer. Add in all the dry ingredients. Mix well. Add apple sauce, vanilla & milk. Pour batter into the prepared pan & bake for 25 mins. Cool on a wire rack. Place another layer of parchment paper on top of the cake & then flip over to remove from pan. Parchment layer will allow it to be removed without falling apart. In a small saucepan over medium heat, combine 1 cup of cherries, sugar, lemon juice, water & salt until they start to break down, stirring often, about 10 minutes. Lower the heat & simmer until the compote coats the back of a spoon, about 15 minutes. Remove from heat, and allow it to cool down. Remove lemon peel & cinnamon stick. When slightly warm, using a hand blender, blend the mixture till smooth. Since I used cherries, it was not very smooth. Stir in remaining cherries. Keep covered & chilled for 3 days. Put room temperature butter in a large bowl & beat well for few minutes till no lumps are left. Add vanilla, salt & cream. Keep the mixer going while adding. Make sure that they are well incorporated before adding sugar. Add in sugar slowly so that it doesn’t fly around all the time beating. Continue beating till incorporated well. 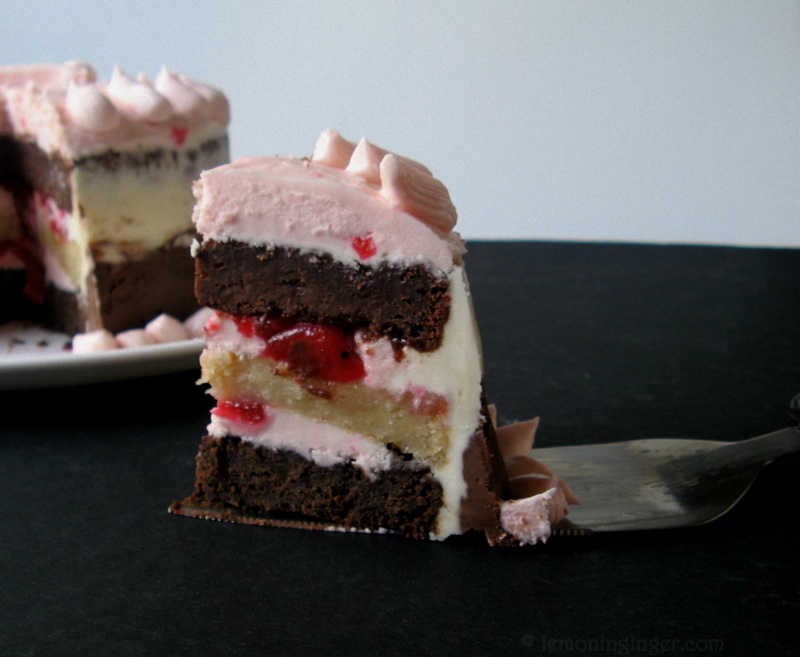 Divide the buttercream in half. Add 3 Tbsps of Cherry Compote (1 Tbsp at a time) to one half of buttercream. You can add pink color here if desired. Set aside. Divide the remaining buttercream into half. Add melted & cooled chocolate in one half of it & mix well till incorporated. Leave the remaining butercream vanilla. On a flat base/ cake board/ turntable/ plate place a small dab of chocolate buttercream in the middle & then place 1 layer of chocolate cake on top of it, face up. 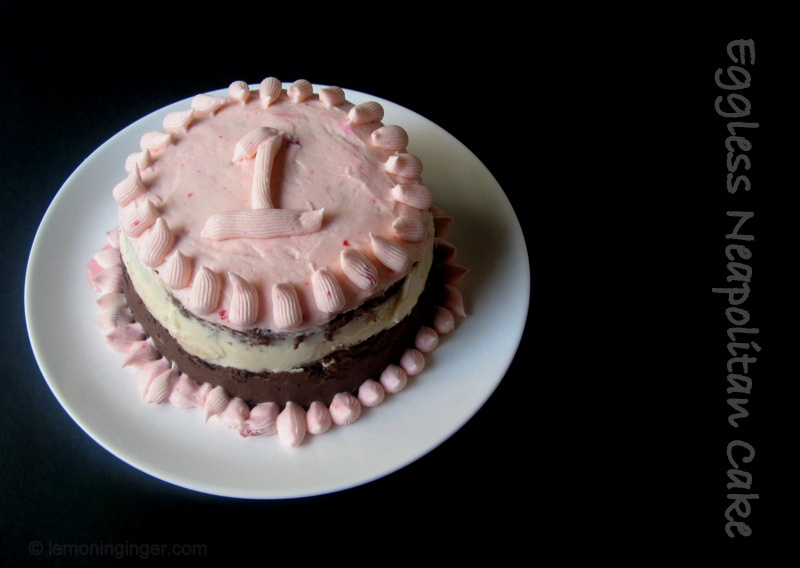 Cover with 3/4 cup of cherry buttercream, leaving with about 1″ clearance around the edges. Now place a few spoonfuls of cherry compote in the center on top of buttercream. 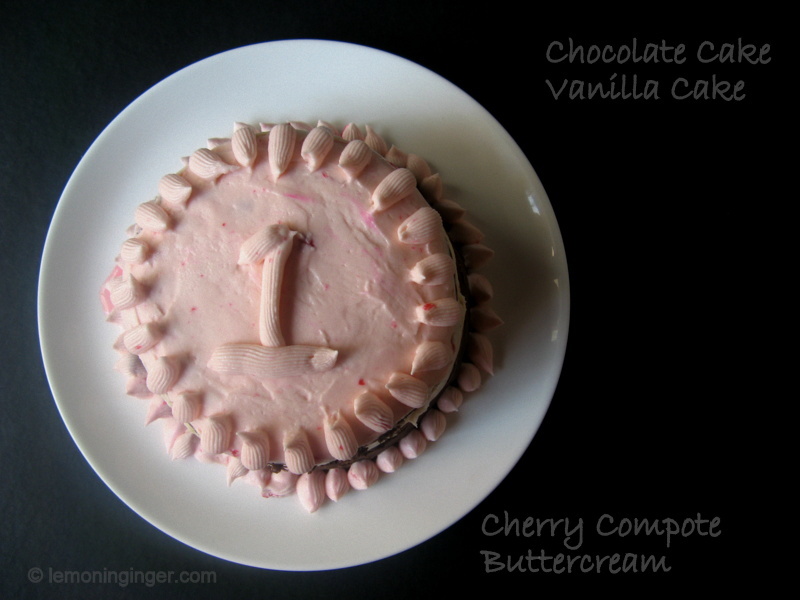 Place vanilla cake layer on face up on top and repeat with cherry buttercream & compote. Place the last layer of chocolate cake face down. Cover the cake in plastic wrap & gently press the cake with your hands for aligning the layers if required. Chill for 30 minutes. Remove from refrigerator. Remove the plastic wrap, do a crumb coat with vanilla buttercream. Chill again for 30 minutes. Cover the bottom half of cake (sides) with chocolate buttercream, top half (sides) with vanilla buttercream & top of the cake with cherry buttercream. Pipe design as desired.